Throughout the Catholic Church’s history, Christian burial has been an integral part of Catholic life. The Catholic response to death stands as a symbol of the central Christian beliefs in the sacredness of human life. 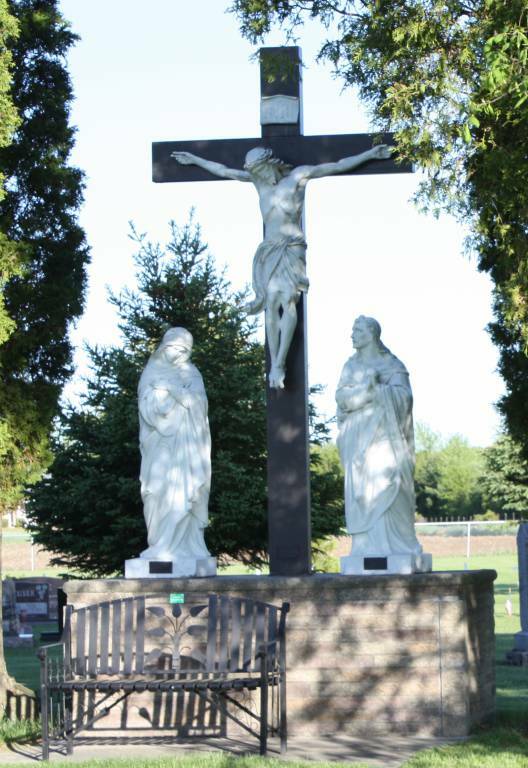 The Catholic Church strongly encourages those who are part of a Catholic community to be buried in a Catholic cemetery. Because of the general care fund for St. Edward & Isidore Cemetery we are able to provide consolation to the living by keeping the grounds looking groomed and peaceful. St. Edward & Isidore Cemetery has been in existence since 1883. The former and current personnel at the parish have been diligent in the upkeep of the cemetery through the St. Edward & Isidore Cemetery Perpetual Care Fund. This has and continues to involve the use of volunteers. There is great pride and responsibility felt among the volunteers, and it is something we are very proud of! The church does not sell ground. We sell burial rights, therefore, title to any cemetery land remains with the cemetery. Anyone wishing to purchase burial rights should contact the caretaker. Prices of graves shall be at the price schedule established by the Cemetery committee. When a grave or lot is entirely paid for, a Certificate of Easement will be issued, giving location, size, and number of burials permitted thereon. The purchase price includes perpetual care. The cemetery authority guarantees the present as well as the future care of the lot or grave. A part of the purchase price is set aside in the manner determined by the Laws of the State of Wisconsin and the income there from used for maintenance. Burial lots and graves, according to the civil statutes, are exempt from taxation and liability for a debt. No mortgage or other encumbrance can be placed on them. No person will be recognized the owner or part owner of a lot, unless their name appears on the record of the cemetery as such owner. No sale, transfer or assignment of a lot or of any part of a lot shall be valid without the written consent of the cemetery authorities. Upon the death of the lot owners(s), the heirs should record in the cemetery office proof of such death and transfer of ownership. Only one headstone will be permitted per grave. When there is a family headstone, a veteran’s government marker may be used as a footstone but must be installed flush with the ground. Henceforth all monuments must be made of granite, marble, or bronze. No plaques or photographs other than those carved in the stone will be permitted. When a monument consists of more than one piece, such pieces must be of the same material and quality. When horizontal slab monuments are used, they must be set flush with the grade line. All foundations for monuments will be built under the supervision of the cemetery authorities. All foundations shall include wings of adequate size for flower arrangements. (Such wings not to exceed the width of the grave.) All footstones must be of one solid piece. The setting of all stones is subject to the control and supervisors of the cemetery authorities. Contractors will be held responsible for any damage done to cemetery property including roads, turf and plantings. Contractors must restore the lots to the same condition as before work was begun. Unless expressly allowed, no monument setter will be permitted to leave litter or building materials in the cemetery over days of general visitation. Benches or other donations to enhance the beauty of the cemetery will be received within the discretion of the cemetery authorities. No interment or disinterment shall be made unless all purchase, transfer or assignment charges have been satisfied. Interment or disinterment charges are due and payable in advance of burial or removal. All interments and disinterments are subject to appropriate civil authorities. No interment shall be made without a burial permit. The cemetery requires a minimum of 48 hours notice for the opening of a grave in the summer, and a 72 hour notice in the winter. The cemetery reserves the right to postpone burial until an appropriate time or later date due to winter conditions. Those who have prepaid will be charged the winter fee at the time of burial if it is requested during the winter. All burials on lots are restricted to the immediate members of the lot owner’s family, that is, parents and children. Other relatives may be buried on the family lot only with the consent of the immediate members of the family and the permission of the cemetery authorities. Burial of two bodies in one grave is not permitted. The only exception would be a mother and a child or two children who have died at the same time. A purchased grave may have one traditional full body burial and/or three cremains if the following conditions are met. First, the traditional vault, full body burial must be first and secondly there must remain at least 12 inches of ground to cover the cremains container. A vault is required for all traditional full body burials, and a durable urn (not wood) for all cremation burials. Funerals within the cemetery grounds shall be subject to the direction of the cemetery authorities. No other ceremony or burial rite except that of the Catholic Church may be used in the cemetery. Exceptions are: the military rites for veterans of all wars, and police and fire men, or with permission of the pastor or caretaker. All grading, road work, landscape work, improvements of any kind, care of lots, opening and closing of grave spaces, and all interments, disinterments, and removals shall be made by the cemetery or its contractors. Lot owners must keep in good repair any structure erected on their lot. Failure to do so will compel the cemetery authorities to order it done or removed at the owner’s expense. No enclosure of any nature such as curbing, fencing, coping hedge or ditch will be allowed around any lot. The use of corner markers is discouraged. Lot owners may not cut, remove, or disturb the sod or turf provided by the cemetery management. To insure proper planting of trees, shrubs, and evergreens, this work must be done with the consent of the cemetery authorities. Planting done without such consent may be removed without notice. No trees, shrubs or evergreens may be planted, pruned or removed without permission of the cemetery authorities. If any tree, shrub or plant interferes with the appearance or proper care of a lot or grave, or appears dangerous to any cemetery structure, it may be removed without notice. Decorating graves with arbors, trellises, boxes, shells and the like will not be allowed. Tri-pod stands are strictly prohibited, with the exception of two weeks after a burial. Cut or artificial flowers are permitted when placed in an approved vase at the ends of the memorial. No glass jars, bottles, or tin cans are permitted. Unsightly containers will be removed. No planting or placing in ground of anything, whether natural or artificial, is permitted. Lawn cutting and trimming in a cemetery is very difficult due to the uneven terrain and hundreds of monuments and markers. To help maintain a sense of order and to facilitate the tasks of cemetery maintenance, regulations have been established and are posted in several places within the cemetery. For safety and for the protection of all, these regulations are enforced. We thank you for your cooperation especially with regard to flowers and decorations. We appreciate your concern and desire to keep up the grounds with the reverence our deceased loved ones deserve. Any inappropriate decoration, or excess amount, will be removed. The removal of flowers or shrubbery from the graves of others is strictly prohibited. The cemetery clean-up periods will be between April 15 & May 15, and between October 10 & November 10 of each year. Picking flowers; breaking or injuring trees, shrubs or any planting; marring or defacing any stone work, object or structure, will subject the offender to the penalties of the laws of the State of Wisconsin provided for such offenses. No firearms or instrument of like nature, as air guns and slingshots, will be allowed in the cemetery. Military units, on formal occasion may, of course, use their arms. No Dogs shall be allowed on the cemetery grounds outside of vehicles unless they are aiding a visually handicapped person. Automobiles entering the cemetery must be driven at a slow speed, not faster than 10 mph.